Hi! 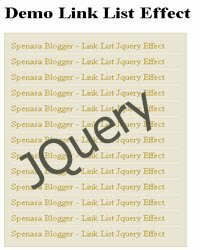 After few days ago I wrote about TipTip Jquery, Today I'll share about beautify sidebar link list with Jquery. Usually we have many link list in the sidebar, like categories, recent posts, or recent comments. We will add an effect to make this list prettier, if we hover to a link, the link will move smoothly to right and will back to original position then. This effect doesn't use a Jquery plugin, but we directly use the function in the Jquery framework. So, don't wait anymore, let's go to the steps! If you have already add this code, you no longer need to add this code again. Then, add this following code. This is the core of this tutorial. How To Make a Bootscreen !